Urinary tract infection (UTI) is one of the common community acquired infections and is seen more commonly in females. E. coli is responsible for about 80-90% of UTI in the community. This is followed by Proteus sp., Klebsiella sp., Staphylococcus aureus, etc. Staphylococcus saprophyticus causes infection in young women in many countries but this is rare in India. In hospital acquired UTIs or in the presence of devices, Pseudomonas aeruginosa, Acinetobacter sp, Enterococci etc., are causative agents depending on the setting. In patients on long term catheters and antibiotic therapy, Candida sp is also implicated. Suprapubic aspirate- only in cases of small children where voided urine is difficult to collect or in adults in case diagnosis is not getting confirmed by voided specimen. Urine specimen must be transported as early as possible. For up to 4 hours delay, the urine should be refrigerated. But it is unsuitable beyond that time when 0.8% boric acid as preservative can be used to store urine for up to 24 hours if transported from distance. Direct Microscopy- Pus cells, RBC, Casts etc. Rapid- Presence of pus cells by leucocyte esterase/nitrate reduction tests. Culture- Semiquantitare culture for determining significant counts. It is the gold standard and is done by semi quantitative culture. The diagnosis is based on the presence of “significant bacterial” counts in the urine specimen. Urine is otherwise a sterile fluid in the bladder but during the passage through the urethra can get contaminated with perineal flora colonizing the lower urethra. A count of 105 bacteria/ml of urine in a clean catch mid stream specimen is “Significant bacteriuria” in a person with symptoms of the lower urinary tract like dysuria, frequency, suprapubic pain and hematuria. On a urine microscopy, pus cells > 10,000/ml along with positivity for nitrite or leucocyte esterase in a symptomatic individual indicates probable UTI. In children commonly, one bacteria per oil immersion field in an uncentrifuged urine sample is considered a possible indication of a UTI. Rarely due to the inflammation red blood cells may be present and thus falsely increase the number of pus cells. Even if urine microscopy or urine cultures are not indicative of a UTI, caution should be exercised in case of obstructive uropathy, patient on antibiotics, hematogenous route of infection, in suprapubic aspirate specimen if the patient is clearly symptomatic.. In children suprapubic aspirate may be needed due to the problem in collecting an appropriate specimen. Any count in this sample is considered significant. Recurrent UTIs may suggest an underlying anatomic abnormality and a urological evaluation with contrast imaging may be required for delineation of the same. 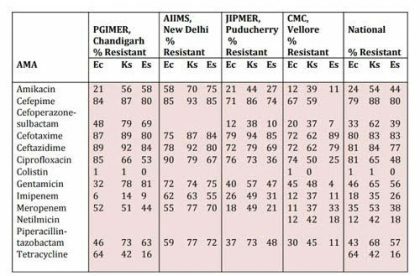 E. coli and other members of family Enterobacteriaceae remain the most common cause of UTI, however antimicrobial resistance is very high to the commonly prescribed antibiotics in various Indian studies and the ICMR AMR network data (Table). Most Enterobacteriaceae isolates are ESBL or extended spectrum betalactamase producing curbing the utility of 3rd and 4th generation cephalosporins and most beta lactam antibiotics. Most often we have to resort to Carbapenems. Table 1. Antimicrobial Susceptibility of Enterobacteriaceae isolates from urinary tract. ICMR, AMRSN data 2014. Note : Ec : E. coli ; Ks : Klebsiella sp. : Es : Enterobacter sp. Urine and blood culture should be done before start of treatment.